A secondary title for this hike easily could be "One Heck Of A Long Hike". 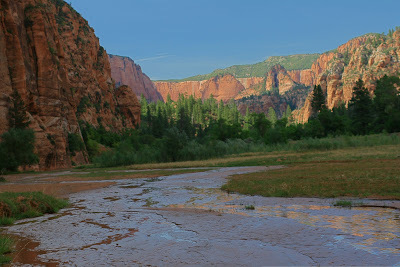 Initially I wanted to do a little backpacking trip and camp out near LaVerkin creek in the Kolob Finger canyons portion of Zion National Park. After my own lack of preparedness and Renee worrying about me hiking/camping alone I decided I would do what I planned to do in two days, in one long day hike. When I say long I mean 20 miles of ups, downs, jumps and ankle breaking tumbles . This was a challenge that few would face and even fewer could accomplish. Brandon, Rod and myself were up for the challenge and decided to determine what was more powerful, our sure to be wrecked bodies after 20 miles, or our minds pushing our bodies forward. Knowing that we were in for a long day we began hiking prior to sunrise and in the cool morning air quickly descended from the Hop Valley trailhead into Hop Valley. Other than dodging cows, their feces and repeatedly having to hop over the stream , Hop Valley was one of the most unique valleys in Southern Utah. Lying in between two nearly vertical sandstone cliffs, the verdant valley would later be salvation for the three of us. After passing through the valley we continued down the now dry wash (because the trail signs had somehow fallen down we actually no longer were on the trail at this point) quickly we realized that a horse could not travel where were were hiking and knew that somehow we had lost the trail, but we continued on. We knew eventually the dry stream bed would run into LaVerkin Creek. As we hiked down the canyon it was a man v wild moment for us. We had to find our way through around dry falls, old landslides, etc. At one point I jumped off a dry fall into the sand below. It turned out to be higher than anticipated fortunately I did not hurt myself but my backpack did not take the jostling well and would later rip apart. The worst part of our off trail adventure was my weathered shorts soon fell casualty and ripped, luckily for me, Brandon, Rod and every other hiker we saw I was wearing underwear! After 6 1/2 miles we finally found LaVerkin creek and set out to see a waterfall in Beartrap Canyon. Every time we heard water cascading we thought surely we had finally arrived at our destination, but every time we "heard" a waterfall it turned out to just be the river. Eventually after traveling through through the Bear Canyon narrows we arrived at a zen like waterfall. It was pretty impressive and for us desert rats a rare beauty. 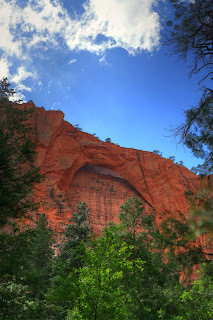 Next we set out to backtrack to where the Hop Valley trail intersects with the LaVerkin creek trail and then hike to the worlds second largest free standing arch, Kolob Arch. Also at this time Rod's knee began to bother him. Somehow Rodney, as my friend Dusty used to say, "cowboyed up" and continued to hike the remaining 2 miles to the arch and 6 1/2 miles back to the car. A lesser man would have crumbled but not Rod! Kolob Arch after years of uncertainty was finally measured by avid arch hunters and after measurement declared to be the second largest free standing arch behind Landscape Arch in Arches National Park. Landscape Arch, in our lifetime will probably break which would leave Kolob Arch the largest in the world. Even though the arch is HUGE it is difficult to comprehend its true size because it is a thousand feet or more up the cliff face. Even so it is something that we could not pass on seeing even though Rod had a bum knee. It also wouldnt stop Rod from hugging the huge ponderosa near the arch viewpoint. After the arch we began the trek back to the car. 6 1/2 miles after already hiking over 13. This homestretch is where the boys would be separated from the men! The hike back was truly torturous. Because we initially were lost and hiked down a canyon rather than remain on the trail, we were uncertain of the challenges that lay ahead of us. The climb out of LaVerkin creek to Hop Valley without a better word, SUCKED!! It was a vertical climb in the full sun. Rod later mentioned that the combination of his knee, and exhaustion was ready to pull out his weapon and fire it into the mountain repeatedly. Finally after what seemed an eternity Hop Valley finally was within sight, at this point I decided I would name this posting Heavenly Hop Valley because the sight of the valley also meant salvation for all of us. Once inside the Valley we decided to take a break, sit on the bank and soak our feet in the water. Even though we all knew that upstream cattle feces was flowing down on our feet not one of us complained! The remainder of the hike can be summed up by paraphrasing Bear Gryllis from Man V Wild. You have to stay focused, keep your spirits high and keep moving!